﻿﻿﻿﻿I know I just recently said that it's not often the boxes of treats arriving at Lapdog Creations are for the humans to munch and review, however we just had the pleasure of indulging in another box. 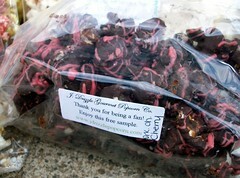 This time it was from J. Drizzle Gourmet Popcorn Company. Company was founded by Joe and Alison Choquette after they had tried many different varieties of gourmet popcorn and had a difficult time believing what they were eating was "as good as it gets." After a year's worth of planning and recipe perfecting, Joe and Alison launched J. Drizzle Gourmet Popcorn Company in October of 2010. 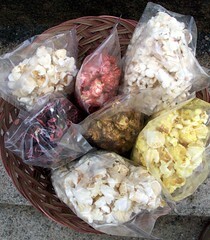 The mission of this Chester, NH based business is simple - to provide the very best gourmet popcorn available, using the highest quality ingredients. My readers know that the only thing I love to support more than products Made in the USA is small business products Made in the USA. However, when it's something made right here in the Granite State, I love it even more that I get to show my support and help spread the word! Of course, when it's a delicious product, that makes my job all the easier and clearly I'm not the only person who thinks J. Drizzle Gourmet Popcorn rocks. They just received an Editor's Pick in the Best of NH 2011 awards from New Hampshire Magazine! J. Drizzle Gourmet Popcorn Company was also recently featured as part of the Phantom Gourmet's Safari Phan Night in Boston. What a fun, basically local business! 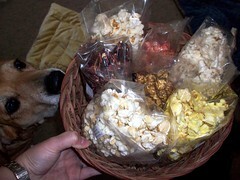 I love savory or salty popcorns, but the Knight loves the sweet ones, so I'll have to visit their site. Sounds yummy! I was betting the pooches got a wee nibble! 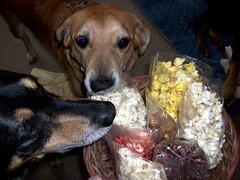 Popcorn is a big favorite around here. It's a treat that everybody can enjoy, eve the birds. 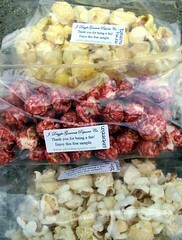 I just plain love popcorn and off to make some lime and salt stuff now!!! Ever hopeful doggies ... I'm sure they'd love a bite! I always love gourmet popcorn. There is a shop in Frankenmuth, Michigan that we always have to stop at when we go up that way. Of course the dogs would have to sample. 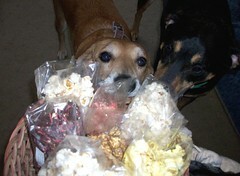 My dogs are major popcorn fanatics. Ooo, that looks super yummy. Hey Nichole! I thought of you this morning when I took the dishcloth you made out of the drawer to do my dishes. That was such a fun contest. Seems like eons ago. Give those dogs a few pets for me. Have a great weekend.